Platinum producer Lonmin Plc (LON: LMI) suspended operations at its Marikana mine in South Africa Tuesday as workers began a wildcat strike. Mine workers refused to go underground and all 13 shafts are not functioning, the company told Dow Jones Newswires. Lonmin employs about 37,000 people – 27,000 regular and 10,000 on contract. A spokesman for the National Mineworkers Union said the strike seemed to be a result of the death of an organizer from the Association of Mineworkers and Construction Union that happened on the weekend, according to Reuters. A mob of hundreds marched to a spot near the mine to wait for their leaders to address them. The Solidarity trade union spokesman told Reuters the AMCU was demanding the NUM close its office at Lonmin. The company’s acting chief executive told Reuters that Lonmin would be telling the unions to not expect much from forthcoming wage talks. 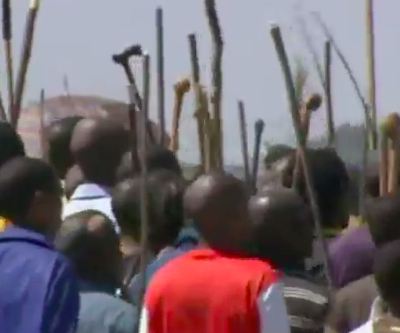 Last year, 34 workers were shot to death by police during a strike at the Marikana mine.